Would avid gamers still be as likely to play their favorite games for hours on end if they had to actually walk around the in-game world? 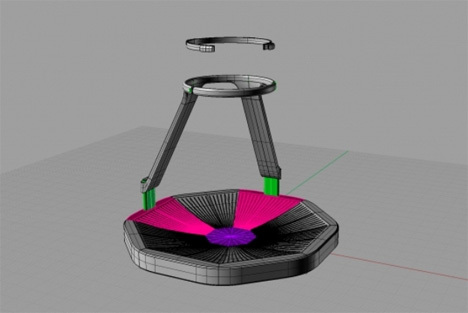 The Virtuix Omni is an omni-directional treadmill that allows players to control their in-game characters’ movements by actually walking instead of just mashing buttons. Looking almost exactly like a grown-up version of a baby ExerSaucer, the Omni features a harness that goes around the player’s waist, allowing him to turn in any direction. 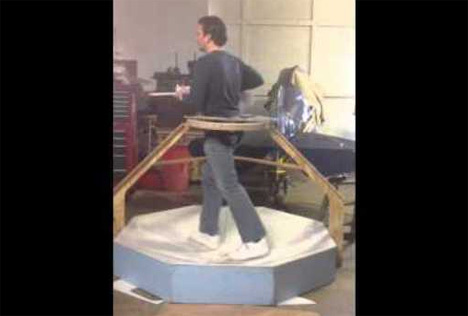 At the same time, the surface of the base lets the user simulate normal walking to get through the in-game world. For people who have very spartan decorating tastes, the Omni will fit right into the living room. It’s “affordable” as compared to some other similar walking controllers, but bigger and more expensive than others. The idea behind walking controllers is to let players feel like they’re actually in the game to increase the reality of the experience. But as an added bonus, treadmills like this one let gamers get up off of the couch and get some actual exercise. Maybe it’s not quite as beneficial as an hour at the gym, but for hard-core gamers who spend entire afternoons exploring the planet Nirn maybe it can help keep extra weight at bay. See more in Gaming & Geek or under Gadgets. March, 2013.